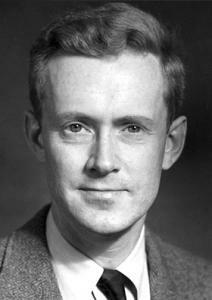 Edward Purcell was an eminent physicist at Harvard who won the 1952 Nobel Prize in Physics. He worked on microwave radiation at the MIT Rad Lab during World War II, and was involved in some of the Trinity test preparations. In this interview, he discusses his time with J. Robert Oppenheimer at Harvard University after the war, and the problems some tenured professors ran into after being accused of being communists. He also mentions Manhattan Project physicist Herbert York whom he praises for his own efforts to chronicle the same period as well as his work on the early American space program. Purcell recalls talking about Eisenhower’s election and the first successful hydrogen bomb test with Oppenheimer. Wendell and a couple of other people at the university, though he was the most important one, were—the [Harvard] Corporation was upset about this. There was a serious question of whether these people might be fired or not. Martin Sherwin: They all had tenure? Purcell: Wendell had tenure, yes. The others did not, so I’m not so much concerned. As I happened at the time myself to have been put on a faculty committee, which had been appointed to consult with the Corporation in case any such case came up at Harvard. It was only shortly thereafter that this broke, and I found myself on this faculty committee. Sherwin: Was McGeorge Bundy dean then? Purcell: No, Mac was not dean at that time. The person in charge of affairs at the university was Paul Buck, who was provost, [James B.] Conant having recently gone to Germany as High Commissioner. Mac was in the government department. Mac took an interest already in what was going on, but he was not—and it was actually Buck who sort of held the whole thing together. The chairman of the Corporation was Charlie Coolidge, and there were four or five other corporation members whom I remember meeting with almost daily for a while. The point was that the Corporation, after a while, had made up their mind in a manner I’m not quite clear on. I think maybe they had finally decided to do something drastic, whether it was fire Furry or what. But they had to clear it with the Board of Overseers, I think the president of which at the time may have been Charlie Wyzanski, who was a federal judge. At any rate, I remember vividly Oppie come up on the crucial morning when the Board of Overseers was meeting and having this—and then Oppie came over to the department after that meeting. I remember his saying, “For the first time, I understand why Harvard has a bicameral system of government.” Because from his remarks and others I heard later, although I’ve never known the whole story, it appears that within the Board of Overseers’ meeting, the Board of Overseers effectively reversed or stopped or did something to the decision the Corporation had thought they were going to do, and therefore didn’t do it. The result was that that had, in the end, a relatively favorable outcome. It was tough on Furry, but it could have been very much worse. In my view, would have been very much worse if Conant had not been off as High Commissioner in Germany. I think Conant would have had less patience and probably would have done something that would’ve been very bad. Now, that was just the year before Oppie’s own troubles began. Purcell: It was also the year before—I took sabbatical in ’53, ’54, which I spent in Surrey and followed only those things at a great distance. In fact, Furry was not out the soup because in the spring of ’54, they had the [Senator Joseph] McCarthy thing again. He got mixed up with McCarthy. This was not McCarthy Committee. Sherwin: No, this was HUAC [House Un-American Activities Committee] without McCarthy. Purcell: Yeah, that’s right. And that whole thing, I was away. I don’t know. Norman Ramsey was really the hero of that, I think, who really stepped in. Because by then Oppie himself was under attack. Sherwin: Right, he was charged or heard about it in December of ’53, and his hearing was in April ’54. Now, this Board of Overseers meeting. Do you know anything about what Oppenheimer’s role was? Purcell: I don’t know. I’d love to know. I would love to know what the record shows on that. As I say, I seem to remember that Wyzanski was the president of the Overseers at that time, although maybe that was later. I don’t know anybody else. Sherwin: Are there any times when you worked closely with him? Purcell: No, no, no. See, I was not in the Manhattan District thing at all. Sherwin: That was the first time you met him? Purcell: Oh, I’m not sure. Sherwin: Or had any extensive dealing with him? Sherwin: No. No, I don’t, tell me about that. That wasn’t that ZORC thing that came up later? Purcell: It was. Yeah, that’s right. It was what was later called ZORC [in an article of Fortune magazine, written at the behest of Lewis Strauss to defame Oppenheimer prior to the revocation of his security clearance]. That’s right, that’s right, exactly. In fact, my first time at the Institute [for Advanced Study], ever be at the Institute, was the day after Eisenhower was elected in 1952. We came down there and we sat around all day in Oppie’s office, wherever it was, over in the other building, I guess. Purcell: Yeah, and talked around about the state of affairs. Purcell: Well, I remember that the H-bomb had just been exploded. Purcell: First shot, that’s right. Sherwin: Early in November. So this must have been sometime after, though, the election. But not the day after? Purcell: This was the day after the election, yeah, I remember that. Then we had dinner over at Oppie’s house that night. Sherwin: Well, that’s very interesting, in terms of the discussion of the H-bomb just having been exploded. What was the general point of view? Optimistic? Purcell: I can’t really remember. That was not the center of our—we were worried about, I think, at the time about the whole armament question and so on. Not in the sort of disarmament part. Some of us had been worried very recently about the anti-submarine problem, worked on that. It was just a little before many of us got involved with Eisenhower through the Killian Committee, got involved very heavily in defense intelligence matters. In fact, nearly everybody there that got involved in PSAC [President's Science Advisory Committee] in one way or another. Sherwin: Right. But that’s ’57? Purcell: That’s ’57, right, that’s ’57. Purcell: Well, it started during that. Because I remember when I came back from the sabbatical, which then was in ’54, I was immediately drafted on what was called the Technological Capabilities Panel, which was a sort of predecessor of PSAC. [James R.] Killian ran that. Sherwin: Oh, Killian ran that at the time? Purcell: Killian ran that, that’s right. That sort of grew in then into PSAC. That’s how I got into the intelligence side of things, the U-2 missiles and all that. Sherwin: Well, was Oppenheimer very involved with you before—? Purcell: He was not involved in that at all, no, no, no. Sherwin: You came in in the Eisenhower period, and by that time he was out? Purcell: He was isolated out here, yeah. That’s right, yeah. Sherwin: Did you see him very much after that? Purcell: No, I didn’t at all. I remember most of the people, nearly all the people involved in this were much closer to him than I was, and had worked with him. He was more or less a legend as far as I was concerned, he had been. Purcell: I’ve read of Herb’s stuff. I think I have. Part of it, yeah. Sherwin: The essential argument appeared in Scientific American prior to that. Sherwin: Given your involvement in some of these, and analyzing some of these issues, how did that book strike you? Purcell: Oh, that’s quite accurate, I think. Herb was very reliable. The thing I was thinking of was what he wrote about how the space program, how the military space program affected civilian space, that whole hopeful development, which I was very close to. It’s very accurate. Sherwin: Well, I don’t know this. Is this a newer book? Purcell: This is not, this is an article. I forget where it’s published. Purcell: But it’s a fairly extensive one. It may be eventually a book. See, right after Sputnik, when the whole space thing started, Herb and I were both on PSAC. We were both of us very much involved in the initial space policy planning, and sort of explaining to the government what space was all about. Herb and I had a little lecture we went around and gave together to government officials and say, you know, what’s going on here, what holds the thing up, what’s going to come from it. We gave the lecture twice in the Cabinet Room, once to the Security Council and once to the Cabinet. Then, of course, Herb later was in the Defense Department as the first Deputy Director for Research and Development. But before that, we were involved in the argument of why shall we set up the, you know, United States space thing as a military thing or as a new Manhattan District, or as it was finally decided, as an outgrowth of NACA, turned into NASA. No, Herb, he’s a tremendous person, he really is one of the great people in my book. Sherwin: Oh, good. I’m glad. I reviewed that book and I was very much persuaded that, from everything I knew, it really analyzed the situation quite properly and said so. Purcell: It was very sharp. Sherwin: So I’m glad to hear some confirmation. Purcell: No, that’s right, it’s very good. He was a very important person, so sharp, because he was in the middle, he knew all that stuff. Sherwin: He’s putting out some very good stuff now, and has a nice program going at UC-San Diego.